Can I tell you something? A secret? Super top secret? I'm not a huge brownie fan. Whoa whoa whoa, I know! Don't get me wrong, sometimes a warm brownie sounds delightful, and it's at those times that you pull out a box mix and forget the ordeal of melting chocolate and whatever else. But really, I'd rather have a blondie. A hint of chocolate, sure, that's good, but I still prefer the non-chocolate base of these. And can I tell you something else? Whoa, these are good. I didn't expect them to be half as good as they are. I was licking the bowl of batter for all it was worth, let me tell you. The peanut butter chips add a little extra somethin' somethin', but you could totally make these just plain and I think they would still be super yummy. Also? These don't fluff up or have weird tall edges along the sides. 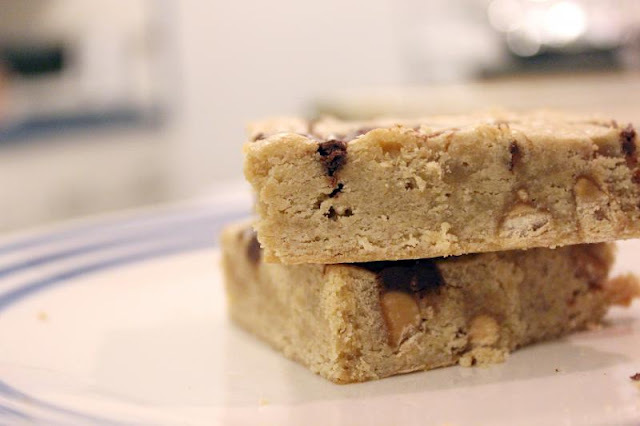 There is no baking powder or baking soda, and you're going to be okay with it. Trust me, they are nice and dense just the way they are and truly don't need any of that! Now let's talk about Nutella. I'm also not the hugest, biggest fan of that either. What! I know, I must be crazy. But in these small amounts like on this blondie? Um, yes. Sign me up. It's enough without being overwhelming. 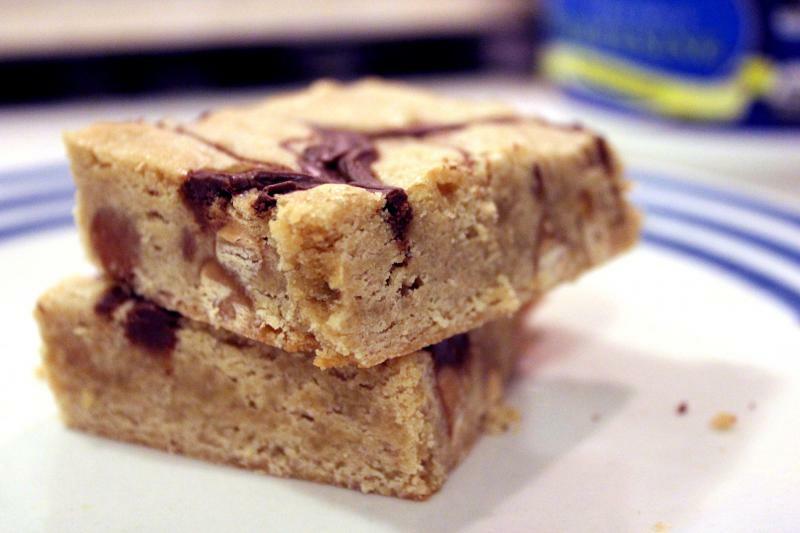 You get a hint of the Nutella flavor, but the real workhorse in this bar is the blondie batter itself. 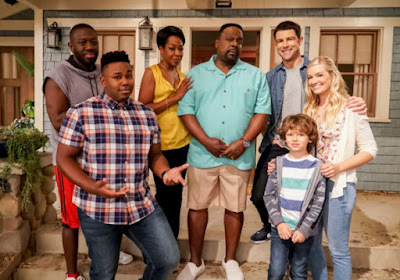 It's really that good. I mean, I hope if you make these you like it as much as I do, because otherwise I've maybe gotten your expectations a little too high. But no, impossible, I say! I declare it! 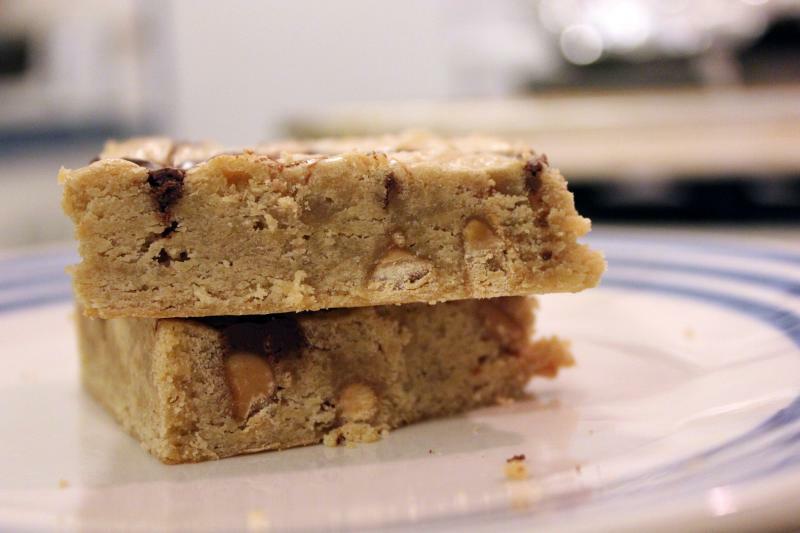 No but seriously, if you like blondie bars, try these. If you like Nutella and peanut butter too? Well, welcome to Heaven. 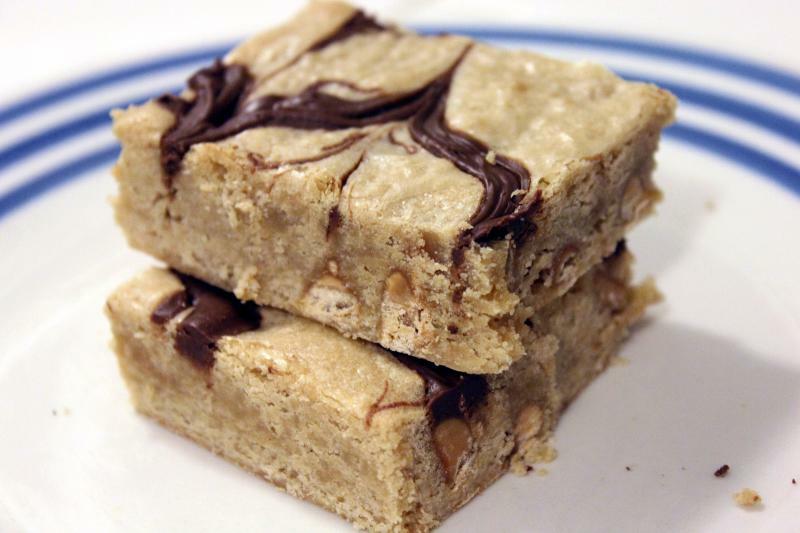 When you want just a slight hint of chocolate and peanut butter in your blondie, try out these Nutella-swirled variety full of peanut butter chips. Preheat your oven to 350°F. Either line an 8x8 pan with foil or spray it with some cooking spray. I have a non-stick pan so don't really need the foil. In a large microwave-safe bowl, melt the butter. Should take about 1 minute. 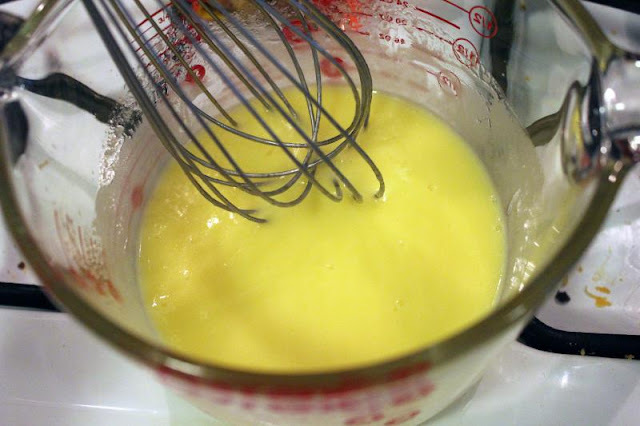 Let it cool for about half a minute, then whisk in the egg. 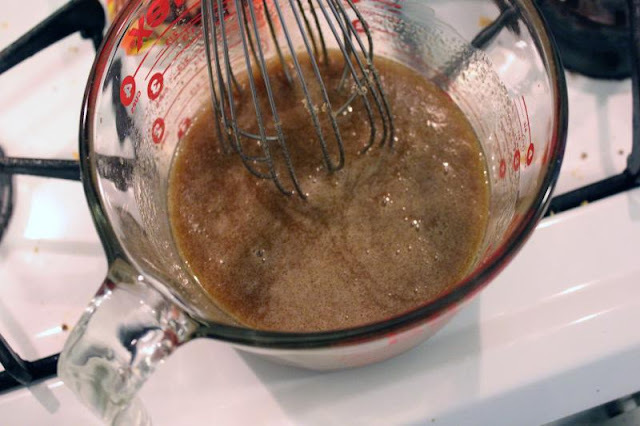 Whisk in the brown sugar, vanilla and salt until smooth. Stir in the flour until just combined, don't over-mix that baby. Stir in the peanut butter chips. 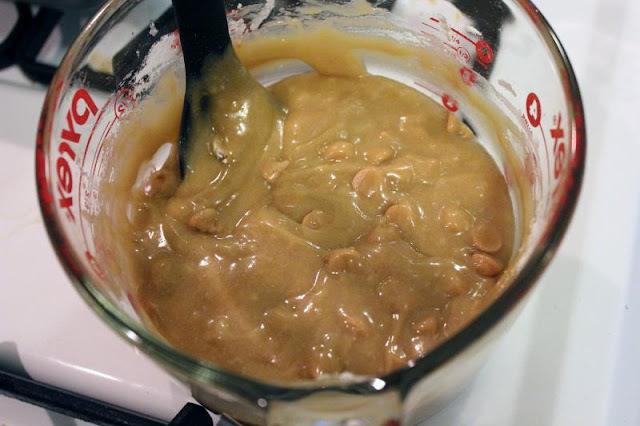 Plop that into your pan and smooth the top so it's even. 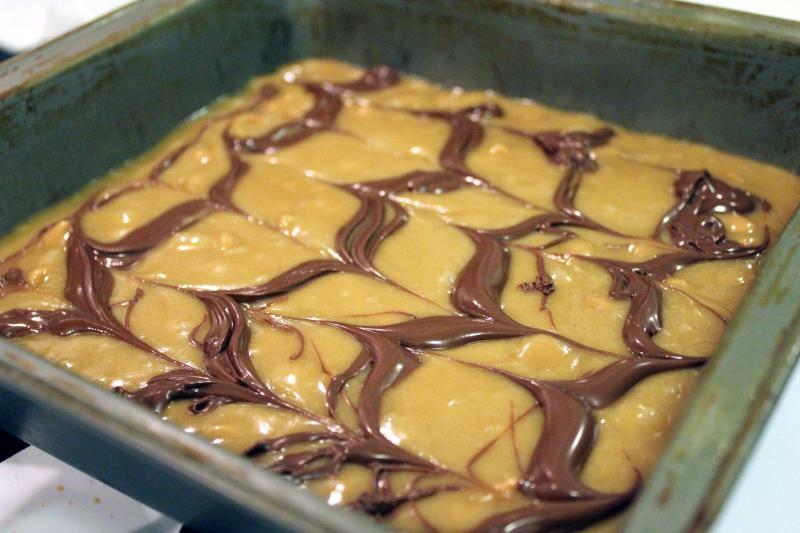 Now, add about 5 lines of Nutella evenly across your batter in parallel lines. Then, take a toothpick and drag it across the lines perpendicularly about 4 or 5 times to get a marbled look. 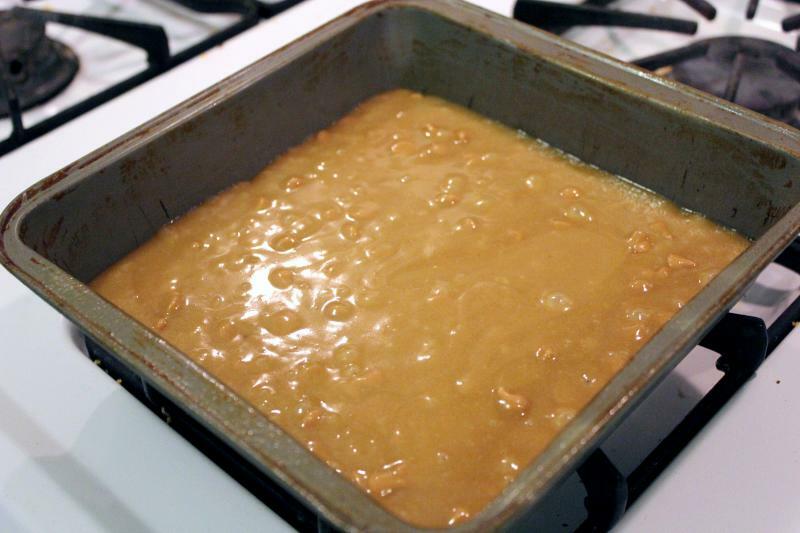 Bake for 20-25 minutes, until done. A toothpick inserted in the center should come out clean. Let those cool in the pan for about 30 minutes, then cut and serve. You've got your butter and your egg all whisked together. 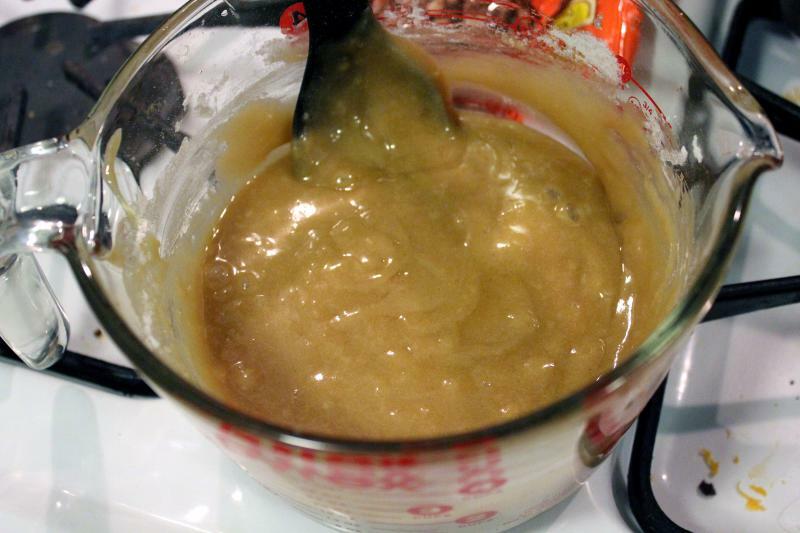 Then whisk in your brown sugar, vanilla and salt. And your peanut butter chips. Spread that in your pan. 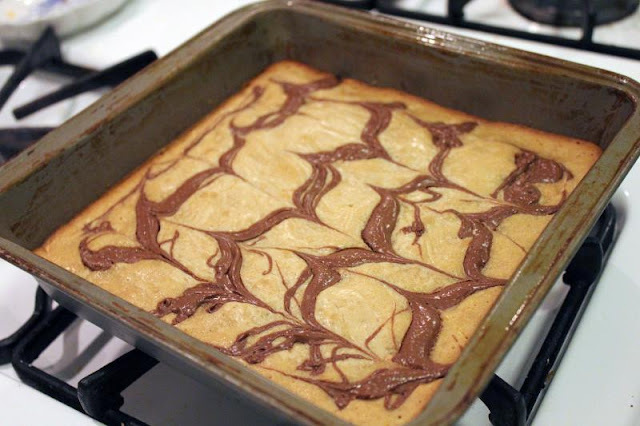 Marble your Nutella on top. Hopefully you can tell ehre there are about four or five lines of Nutella, then a toothpick is swiped down the opposite direction of the lines to create the marble pattern. Bake at 350F for about 20-25 minutes until a tester inserted in center comes out clean. Let it sit for 30 minutes before you slice into it. Then get to slicing and enjoy!